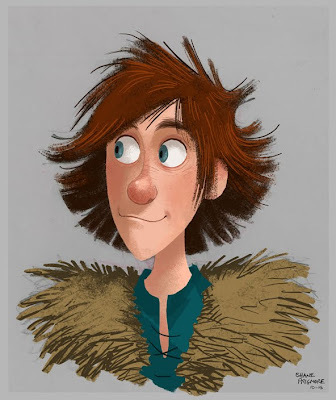 Chris and Dean asked me to come on board to collaborate with them and my friends Nico Marlet (lead designer/genius) and Takao Noguchi(awesome designer) to finalize the design of the main Character "Hiccup". 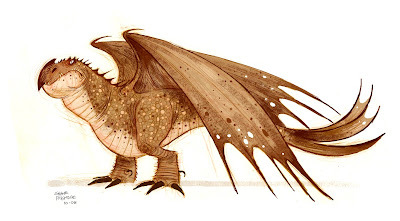 Then a small team of us were asked to explore an entirely new Dragon and main character "Toothless the Night Fury". (Below are a couple of my pieces that appear in the art of book.) The environment was always open and collaborative. A couple character thoughts I suggested even made it to the screen in all of this. My contributions were definitely a speck in the big scheme of Dragons, So read the credits in the theater and give that amazing crew a round of applause. They've earned it. Dreamworks takes a lot of flack about their films both story wise and look wise, and sure, some of it is justified. "SOME" of it. It's great that Kung Fu Panda opened some eyes, But wait, there's more. An incredibly talented team from many varied backgrounds and experiences came together to make Dragons something special. Go see it and have a blast!! !